How Fast It's Going, Who Is Doing It, What They Are Doing, and Who Is Sponsoring It? 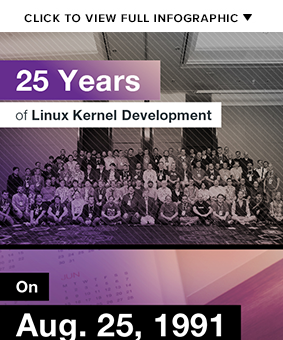 To celebrate the 25th anniversary of the Linux, we've released our seventh edition of the Linux Kernel Development Report. It analyzes the work done by over 13,500 developers since the kernel’s early days, as well as more recent trends. Over 13,500 developers from more than 1,300 companies have contributed to the Linux kernel since tracking began 11 years ago. The Top 10 organizations sponsoring Linux kernel development since the last report include Intel, Red Hat, Linaro, Samsung, SUSE, IBM, Renesas, Google, AMD, Texas Instruments and ARM. The rate of Linux development continues to increase, as does the number of developers and companies involved in the process. The number of unpaid developers continues its slow decline, as Linux kernel development proves an increasingly valuable skill sought by employers, ensuring experienced kernel developers do not stay unpaid for long. DevOps Networking Forum 2016 was a day-long exploration on the intersection between Devops and Networking, featuring an impressive lineup of guest speakers.